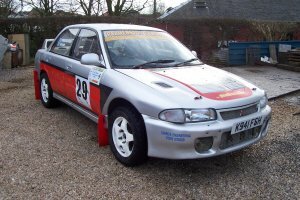 The Lancer was built in the early 90's by Dom Buckley Motorsport and was rallied by Dom for a few years before selling it. It has had two other owners before we bought the car in October 2003. The car has had a bit of work done over the winter 05/06 to make the car lighter and to get the power up a bit. A GEMS engine management system has been fitted and a lot of the unneccessary interior fittings have been removed. Engine Mitsubishi 1998cc turbo charged 16 valve twin cam.